This EXCLUSIVE wedding gift shows your parents (Mom, Dad or Mom & Dad) and your father and mother-in-law how much you appreciate them. This is a great Thank You gift for parents as you start a new chapter in your life like your marriage or graduation or any time you want to show your appreciation. 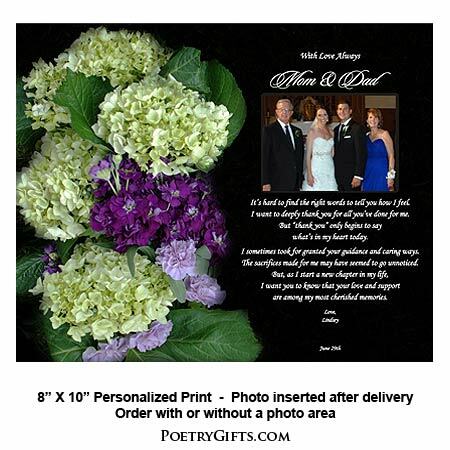 No need to send us your photo, the cut-out photo area allows for a photograph to be easily placed behind poem at any time. *Thank You Gift Idea* Not too late to thank your parents for their help with your recent wedding, graduation, landing a new job or any important occasion in your life. 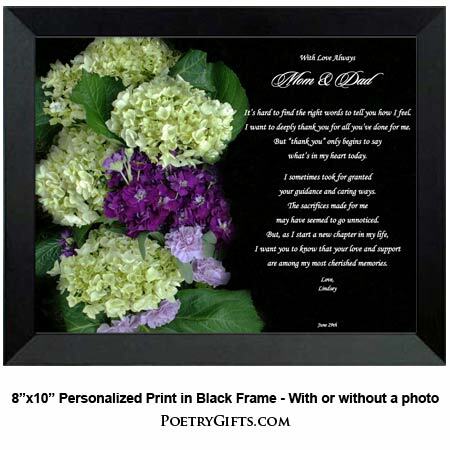 Colorful hydrangea flowers on a black background is the perfect backdrop for this heartfelt To My Parents Thank You poem. 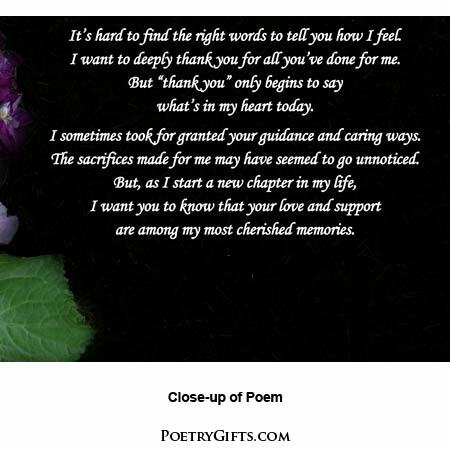 There is no doubt that after reading this personalized poem, mom and dad will truly feel that you treasure all of their love and support. Parents will proudly display this gift and enjoy reading it over and over again especially after you place a favorite photo in the cut-out opening. 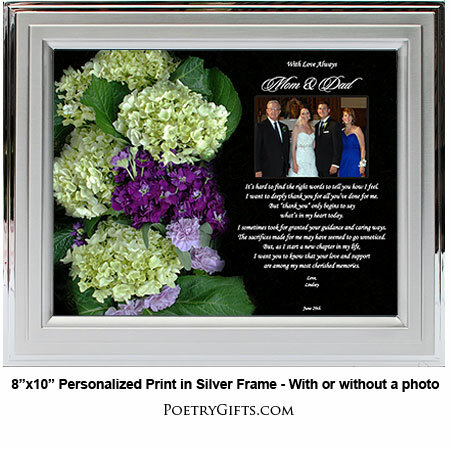 ($19.95 is the unframed price) What a wonderful keepsake for any mother or father. 3. Closing Phrase and Your Name(s) (as seen after poem) - Examples: Love Always, With Love & Appreciation, etc." 4. Optional Phrase and Wedding Date - (Example: Justin & Lindsey's Wedding Day - June 29th)"